Some Filipinos are not aware of breast cancer. Some patients just ignore it because they cannot afford a doctor especially the expenses for a series of tests. 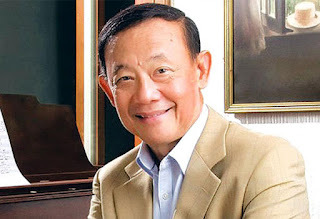 I salute Jose Mari Chan for helping and giving hope to breast cancer patients in this time of season. Thank you! I've heard about this too. What a great cause. Goodluck to everyone who organize this and praying for a successful event. It's a nice concert with a good purpose. Hope that many of us would be interested in activities like this.thumbs up! This is a great event as most people needs knowledge and needs to be educated regarding breast cancer as some are not aware of it. I am hoping for the success of this event! Good luck and More powers to everyone! One of the local singers is my highschool friend. I'm glad that she's partaking with this kind of events that promotes a good cause. Hope it turns out successful! I adore how people organizing this event as well as those who will participate, pour their love to those in need. This is really the true meaning of Christmas! 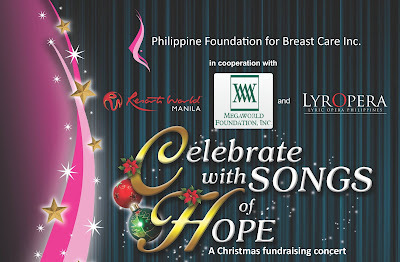 Concerts for a cause not only lifts our awareness by helping them raise funds but also soothes our souls through music. Shared this blog post of yours on my twitter account so my friends will be aware of this fundraising event. God bless! I can still remember when I got a lump on my breast few years back. Thank God it's not malignant. I think having a breast or ovarian cancer would be the toughest battle a woman could ever encounter. I can still remeber when I discovered a 5 y/o lump in my breast few years back. Thank God it was not cancerous and my operation happened five years ago. I think the toughest battle a woman could ever encounter would be having a breast or ovarian cancer. Hope your event will be a great success ! Wow!! I am so jealous. how I wish i get the chance to watch it.